The Khronos™ Group today announced the ratification and public release of the OpenCL™ 2.1 provisional specification viewable at www.khronos.org/opencl/ so developers and implementers can provide feedback before finalization at the OpenCL forums. Comments can be made via https://www.khronos.org/opencl/opencl_feedback_forum. The OpenCL 2.1 C++ kernel language is a static subset of C++14 that provides lambda functions, classes, templates, operator overloading, and many other C++ features to free developers from low-level coding details. OpenCL C++ enables reusable device libraries and containers for easily sharable code that includes templates and enables meta-programming. Low-latency device timer queries support alignment of profiling between device and host code. 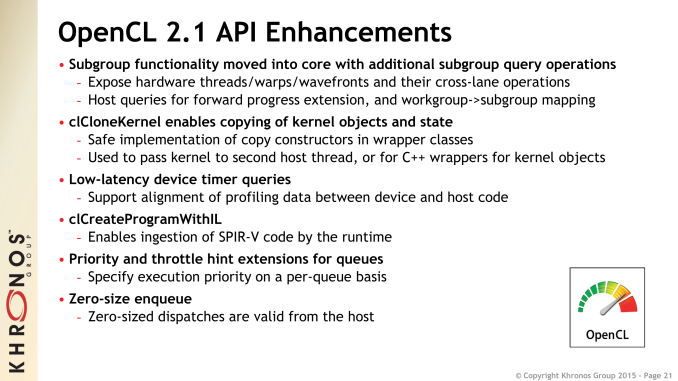 Support for the new Khronos SPIR-V™ intermediate language in core for kernel language flexibility, sharing of common compiler front-ends, and the ability to ship kernels without exposing source code. Khrnonos claims OpenCL 2.1 preserves “backwards compatibility and being able to ship on any OpenCL 2.0-capable hardware”. Important for commercial codes, OpenCL 2.1 will incorporate support for the new SPIR-V open standard, cross-API intermediate language that natively represents parallel compute and graphics. 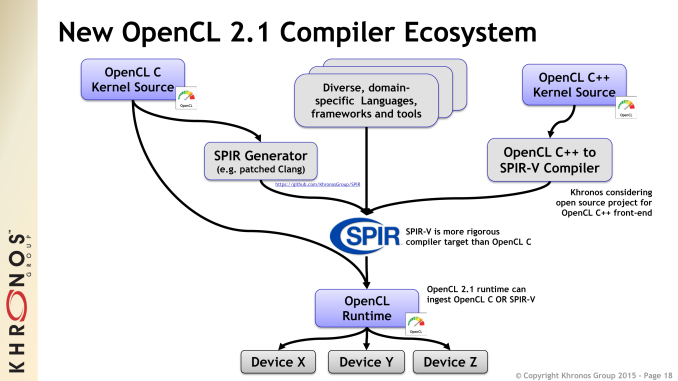 SPIR-V exposes the machine model for OpenCL 1.2, 2.0, 2.1 and Vulkan – including full flow control, and graphics and parallel constructs not supported in LLVM. SPIR-V also supports OpenCL 1.2, 2.0, 2.1 kernel languages as well as the GLSL shader language for Vulkan (under development). SPIR-V can split the compiler chain across multiple vendors’ products, enabling high-level language front-ends to emit programs in a standardized intermediate form to be ingested by Vulkan or OpenCL drivers. For hardware vendors, ingesting SPIR-V eliminated the need to build a high-level language source compiler into device drivers, significantly reducing driver complexity, and will enable a broad range of language and framework front-ends to run on diverse hardware architectures. For developers, using SPIR-V means that kernel source code no longer has to be directly exposed, kernel load times can be accelerated and developers can choose the use of a common language front-end, improving kernel reliability and portability across multiple hardware implementations.